Tucked away in downtown Arlington is one of my favorite little hideaways, The Sanford House Inn & Spa. The elegant Southern-style Manor House is nestled into an outdoor grand courtyard that blooms brightly with flowers and is shaded by towering trees. Any given day, I would relish an opportunity to sneak away from the hustle bustle to enjoy a glass of wine in the gazebo, luxuriate with a spa treatment or blow my diet on an amazing meal at restaurant506. What can I say except, much like Ron Burgundy, this place is kind of a big deal to me. So when they announced a wine social series the first Thursday of every month, the real question is why WOULDN’T I attend? Last night, I attended the Sip &apos;n Swirl at Restaurant506 to enjoy appetizers and four amazing wines (Chenin Blanc, Chardonnay, Meritus and a red blend) from the Lone Star State’s own Fall Creek Vineyard, rooted in the Texas Hill Country. Upon entering, I found small clusters of friends chatting, laughing and enjoying each other. I normally ignore sweet wines, but their Chenin Blanc was a fruity, flowery, delightful way to ease into the evening. 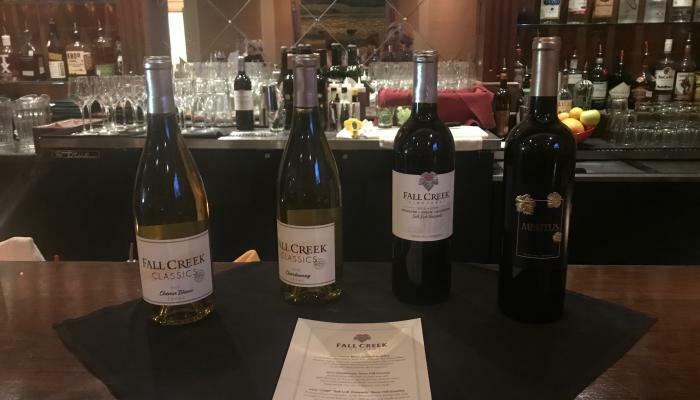 And the only thing yummier than the great vibe in the room was my favorite Fall Creek wine, the bold and flavorful Meritus. A sommelier might not have paired it with the house specialty dessert that I couldn’t resist trying, but I sure enjoyed it…banana cake and oaky red wine. Sure! Give it a whirl! If this sounds like fun, don’t miss the next Sip &apos;n Swirl at Restaurant506 on November 1st from 5-7 p.m. You will receive a flight of 4 (3 oz) pours of wine AND light appetizers. No reservation required, come and go, $20 pp. Even if you aren’t a wine drinker, The Sanford House is cooking up a variety of other events for the fall and winter. They recently had their first courtyard yoga event, and its success is prompting new yoga or pilates dates to follow. Or how about a whiskey/cigar night that is coming soon! 10/23 – Chef Demonstration at Viridian ($45 pp) –Chef Joey Villarreal is a delightful conversationalist, but don’t let the nice guy smile fool you. This 24-year culinary veteran, who is an advocate for locally-sourced ingredients, is passionate about his craft, and boasts a stellar resume! Joey began cooking at age 17 and has tantalized tastebuds around the globe: Bahamas, Puerto Rico, New York, Istanbul, Boston and more. 10/25 – Sanford Spa & Salon Open House - free and open to guests! Mini-services available (one-minute manicures, chair massages, skin evaluations), a raffle for a TSH gift card, light appetizers and wine available for guests to enjoy; any services booked will have special discounts applied. ***NOTE, this was a lifesaver for us several times, highly-recommend!! !